Periodically changes colors (blue, purple, yellow). Yawns, sits, and lies down. Occasionally paws at the ground and dances. Targeting Twilight and emoting /dance will cause her to dance. Emoting /sit while targeting her will cause her to walk over, jump onto your lap and lie down. This pet will sit on top of a summoned Pilfered Sweeper toy. Requires purchase from Blizzard Store. This pet is available for digital download exclusively from the Blizzard Store. It may be purchased using any major credit card. 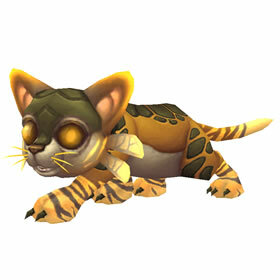 Players who purchase this pet will receive a code which may be redeemed on any WoW account. All WoW accounts (of the same region) under one Battle.net will have access to this pet. Codes may also be purchased as gifts for other players. Deals 295 Elemental damage instantly. The enemy Burns for 137 additional Elemental damage per round for 2 rounds. Blasts the opponent with a pillar of holy fire, dealing 492 Humanoid damage and has a 25% chance to stun the target for 1 round. Great PVP pet. With the new Beast Brawler acheive, this is a must pet. Don't bring him out at beginning, this is clean up pet with his ability to stun. Vengeful Porcupette is great at beginning to clear up those undead that everyone wants to play, so speed him up and protect yourself with Spirit Spikes. Corgi's are good also, even a fast 325 Summit Kid. Argi is another, always cast Headbutt first, stunning is your friend. Hope this helps. Artox. It will most likely be added to the API with the release of Patch 7.3--Tuesday, 8/29/17. Try updating after that time. As of today it still hasn't updated in my collection. The button to manually try it is gone now too. I've had great success with this pet in pvp matches with a dazzling dance pet. Ive been able to chain abilities so that I have taken out opponents pets before they could even attack. As of today still not updating to my collection. Same, I own it but it is not updating in my collection. Still not being updated into my collection. Wonderful little kitty! -I have her but cannot get the account to update. Wow's armoury took a bit to show this too, but now it does. Fabulous pet! So pretty kitty! Twilight is vibrant and an amazing beast pet. She is 1 of the 2 beasts that has the Call Darkness ability. She also has the Surge of Light ability allowing her to stun non critters at 100% of the time. At 277 atk and 293 spd, she doesn't hit as hard as other pets but because of her speed, she can often land multiple hits without being retaliated against. As for Spore Shrooms and Drain Power I do not feel they have good synergy. She is a darkness pet exclusively. Changing mood colors - blueish,yellowish,purpleish. Surge of light & Darkness in 1. Great dps,stun ability. If you choose Twlight Fire in 1st slot then you have 3 abilities all with a (different) cd. Dunno about that. I used pounce 1st slot mostly. Think it is a really fine pet to have in my bag. This energetic kitten changes colors depending on its mood.